Apple Bough by Noel Streatfeild was first published in 1962 and it’s about the Forum family which consists of two boys and two girls. Their parents are quite feckless really where the children are concerned as they’re both more interested in their own lives, the father being a musician and the mother has taken up painting – to the exclusion of just about everything else. Money is always a problem, but when it turns out that the eldest boy Sebastian is a gifted violinist Miss Popple is employed to teach all of the children as an ordinary school is of no use to Sebastian. Apple Bough is the name of the family home and they all love it, but Sebastian’s talent means that they end up travelling the world in his wake, something which seems exciting to begin with but soon palls as far as the other children are concerned. The parents are far too busy enjoying themselves at all the parties involved and being the parents of a child prodigy that it never occurs to them that the three other children are losing out on having lives of their own. The children are more mature than their parents are as quite often happens in some families. Eventually it all ends well though. This was an enjoyable read albeit a bit unlikely and far-fetched at times. This entry was posted in Books and tagged A Puffin Book, Apple Bough, children's classic, Noel Streatfeild, Puffin by Katrina. Bookmark the permalink. I read a lot of Noel Streatfeild’s books as a child, but this one doesn’t seem familiar at all. I’ll have to think about reading it as it sounds as though it can be enjoyed by adults too! I like to catch up with books I missed out on as a child and I must admit that I often buy old Puffin books just because I like the covers and illustrations. 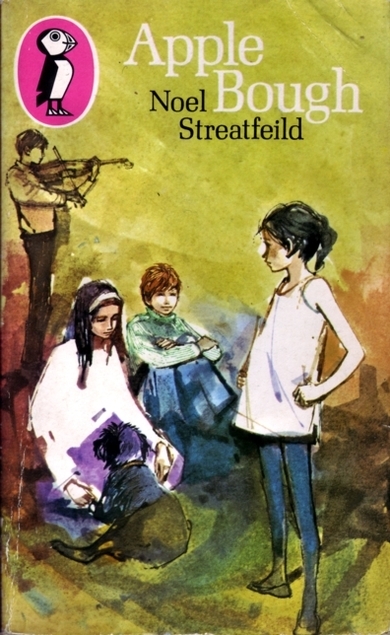 I can’t remember which Noel Streatfield book I read during the time I worked in a children’s bookstore (the largest in New England and called “The Little Book Shop). I was interested in all sorts of English children’s books at that time. Do you have a favorite or favorites among Streatfield’s books? It’s too soon to say which is my favourite as I’ve only read a few, but yesterday I bought Streatfeild’s The Growing Summer which was apparently made into a TV serial, I don’t recall it but I think it might be fun. I was all excited thinking this was a Streateild I had never read but it turns out it just has a different title in the US. However, I haven’t read it in many, many years so I may be buying a copy anyway. I’m so glad that you discovered you had already read it, it’s so annoying that they change the titles. I’ve been caught out that way before. Have you read The Growing Summer? Yes! It is one of my favorites though it is called The Magic Summer in the US. I just recommended it to my daughter a few days ago. Now I am going to have to find a copy for her. Ooh. The Growing Summer has just jumped right up my reading queue! Thanks.